One of our writers here at Wetravel, Kayla Bernardino, has put together some of the hottest gift ideas for the travel lovers in your life. Take a look to help you decide the best presents for your friends and family this year! With the holidays approaching, it’s time to begin thinking about presents for your nearest and dearest. I celebrate Christmas, and although none of my family members are very materialistic (every time I ask my father what he’d like, his reply consists of some variation of “just be a good kid”), I have always loved putting in the time and effort to figure out the right gifts for people. There’s nothing better than a gift that is relevant to someone’s needs or interests. Here’s a round-up of gift ideas, geared towards those explorers in your life. I hope it gets the cogs in your brain turning! The Hammerhead One– perfect for your cyclist friends who are looking to explore more. I love the simplicity and almost ordinariness of the clock. It doesn’t have much of a retail presence in the United States yet either, which makes it a unique gift. Choose from gray, burnt orange, and blue. 2. Hammerhead One ($85 for one, $160 for two). Representing a great deal of hard work and dedication, this is the first product by Hammerhead Navigation, a member of R/GA’s first accelerator program back in 2014. Built to “help cyclists discover great, safe, bike routes anywhere in the world,” the smart device is the best way to explore both urban and rural environments. The idea is simple. Just plug in your desired route via the accompanying smartphone app (or select from routes created by other community members), and pop your phone back in your pocket. Next, let the LED lights guide the way. Promising visibility in all weather conditions and equipped with a battery that’s designed for long rides, the Hammerhead One is really paving the way for optimized bicycle navigation. My favorite part about the Hammerhead is its seamless design. I’m one for aesthetics, so the look and feel of a device is very important to me. Though I’m more of a runner myself and have never really picked up cycling, I know of many people who would absolutely love receiving this as a gift. 3. 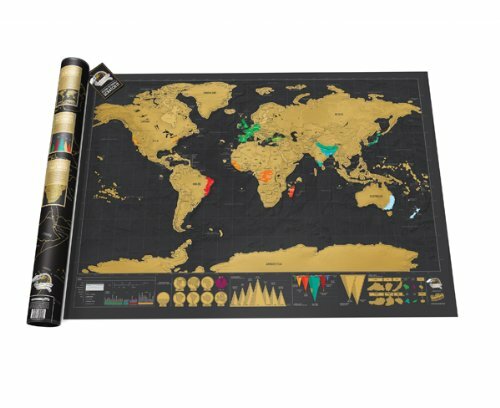 Scratch-Off World Map (Varies, $29 from UncommonGoods). Tracking the cities and countries that you’ve been to is always fun (I currently use this Travel Listography diary). Scratch-off world maps serve as a great visual representation of one’s travels. So great that I am actually debating purchasing this product for myself right now, especially with such a fair price. Try buying a scratch off map for your loved one so they can show off all the places they’ve been to! 4. Cork Globe ($147, Amazon). Essentially the same idea as the aforementioned wall mounted map, I find the cork globe to be more appealing, albeit slightly more expensive. While mobility might be a concern for some, I think this is definitely easier to transport than a map with pins all over it. Obviously, it’s easy to re-pin places, so it really isn’t that big of a deal in the end. Ultimately, it depends on the look/feel that you’re going for, whether you want something on your wall or on your desk/dresser. Either way, you really can’t go wrong! The Gobi Gear HoboRoll would be great for your explorer friend. 6. Gobi Gear HoboRoll ($39, Amazon). “The Essential Stuff Sack for Life’s Adventures.” I’ve always used Space Saver Bags while traveling to help me fit more in my duffel bag. This HoboRoll improves upon the design in that it comes with 5 internal compartments, helping to keep things separate. One problem with the Space Saver was that everything got mixed up because there’s only one main compartment. With the HoboRoll, you can find what you need quickly with the same ultra-strong compressibility. Perfect for the minimalist traveler. 7. Travel Bra ($59 retail value, Kickstarter). Designed with safety in mind, the Travel Bra is the best way to store valuables while on-the-go. The team worked with a lingerie designer to ensure comfort as well as functionality. “No hook and eye to dig in to your back while seated on a bus or plane, wide shoulder straps and wide arm holes that won’t cut in to you by the end of a long day, soft bindings, no scratchy labels, soft strong mesh back with plenty of real support, and sewn with flat seam stitching.” It’s anti-microbacterial and can go longer between washes, a feature that comes in handy for the backpacker. Note: The first 2,000 backers on Kickstarter will receive their product by December 2015. Those who follow will receive their garments in January or February 2016, so get in on the action early! Only a little over a week to go! Now, if these gifts are out of your price range, you also can’t go wrong with a book about your friend’s dream destination or a small gift that reminds him or her of a place they went to in the past. Maybe even a framed photo (go to IKEA for a nice, cheap frame and print out a photo at Walgreens for <$1). For those of you pinching pennies this season, practical gifts can be homemade as well, which I personally think are the ultimate display of thoughtfulness! I’m sure you’ve heard it before, but it really is the thought that counts. If you would like to write a guest post or would like your own travel blog to be featured, reach the Wetravel blog editor, Christina Nguyen, at christina.nguyen@wetravel.to.